Planeta 42 Fun Knowledge Levels and rewarding badges for completing games. Mastering Planeta 42 Games, You increase in Knowledge Level. When you complete any of Planeta 42 education games, your level will be increased with plus one. The overall level include acquaintance in Knowledge, Science and Lore. Levels are saved as cookies. To work properly, the online games and the knowledge levels needs flash player installed. If there is a "0"(zero) near the "Level" under the header, everything's OK. Levels are saved as cookies, if they are disallowed, the browser reinstalled,or the computer changed, the Levels may be lost. But worry not, every time the Levels need rebuilding, it will be faster, because You will be smarter! Because of this technology, there is no registration required on Planeta 42, and yet the knowledge achievements can be saved. they will increase the local computer levels only, and not that on Planeta 42 website. 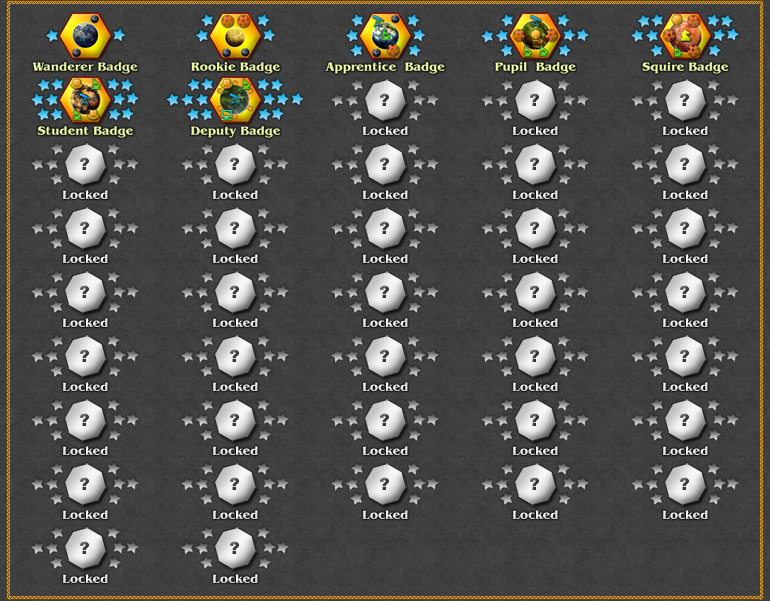 High Levels will unlock fun Ranks and hidden games. Check when level is increased. For every 5 levels, a fun game may be unlocked. Check for achieved fun ranks. Ranks are badges given by Planeta 42 authority.